FREDERICKSBURG, Ohio — For Kelly McKelvey — living and working on the family farm in Fredericksburg for the past 60 years — being a good farmer just comes naturally. “It’s the only job I ever had,” he said. Thinking back, McKelvey said he was probably in the fifth grade when he started driving tractors around the farm. McKelvey and his wife, Connie, raised four children on the homestead, one of which will be taking the reins of the operation in the coming year. Every year, the Wayne Soil and Water Conservation District awards one deserving farmer with its Cooperator of the Year Award. 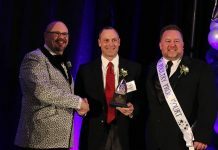 “We hand out the award every year to a producer installing conservation practices on their own, with help from us, or who have that conservation mind-set,” said Adam Liston, district program administrator for the Wayne Soil and Water Conservation District. 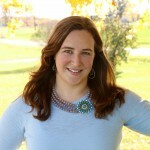 McKelvey, of McKelvey Dairy, just happens fall under all three of these categories. A year or so ago, McKelvey wanted to install a grass waterway and put in some filter strips, which he accomplished with help from the SWCD, said Liston. “He has a conservation plan and also a comprehensive nutrient management plan,” he said, adding McKelvey manages his manure storage well and any excess manure is sold to a neighboring grain farmer. These are just some of the reasons Wayne SWCD board chose McKelvey for the award. 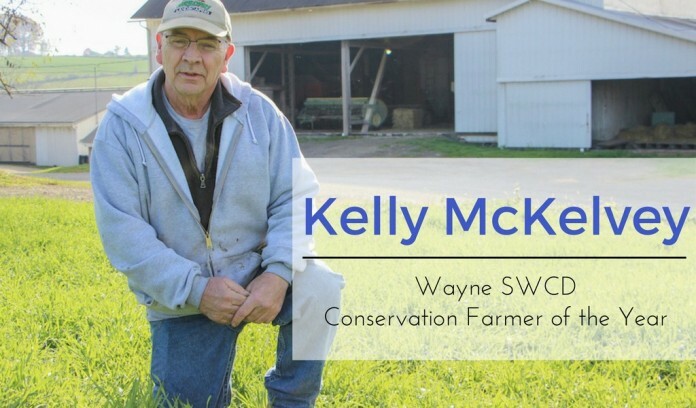 Kelly McKelvey’s use of cover crops is just one of the reasons he was selected as Wayne Soil and Water Conservation District’s Cooperator of the Year. 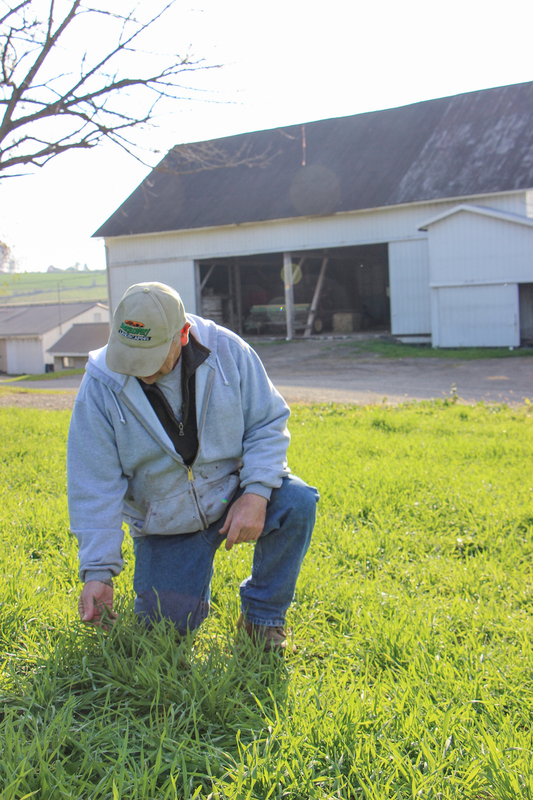 This rye grass, planted in the fall, is used to help lock in soil moisture, restore nutrients to the soil and serve as an additional forage for the dairy herd. The farm started out as 80 acres, homesteaded in 1815 by McKelvey’s great-grandfather, and has expanded to around 200 acres and some additional rented ground. The McKelveys raise corn, hay and small grains, mostly for forage to feed the dairy herd. The crops are on a three-year rotation cycle and cover crops are used extensively, explained McKelvey. McKelvey said they have also experimented with killing the cover crop and strip tilling directly into the stand. Leaving rye stubble on the ground helps to hold moisture in place, he added. While they currently use primarily rye as a cover crop, McKelvey said he would like to try some radish varieties to help break up compaction. McKelvey also works to maintain waterways and filter strips on his land. “We learned pretty quickly, on these hills, if you misplace a waterway, Mother Nature will let you know real quick,” he said. Each piece of ground that McKelvey rents is treated and maintained as if it was his own. To assure the landowners that he is not robbing the soil of its nutrients, he performs yearly soil tests and soil mapping of the whole farm. 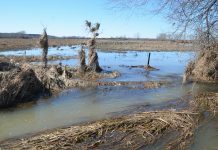 “We try to have a yearly meeting with (the landowners) and show them what we are doing and what practices we are using,” he said. “We treat their farm like our own,” he said. Now, the McKelveys milk around 230 head of Holsteins. McKelvey’s son, Matt, manages the dairy herd. About three years ago, Matt encouraged his father that a robotic milking system was the way to go. “It’s a nice way to milk the cows, but for the younger generation,” said McKelvey, noting how his son can easily work with the machines by just using his smartphone. McKelvey would rather spend his time working on tractors or being out in the field. “I am not the cow man, I’m more of the equipment/maintenance man,” he said. 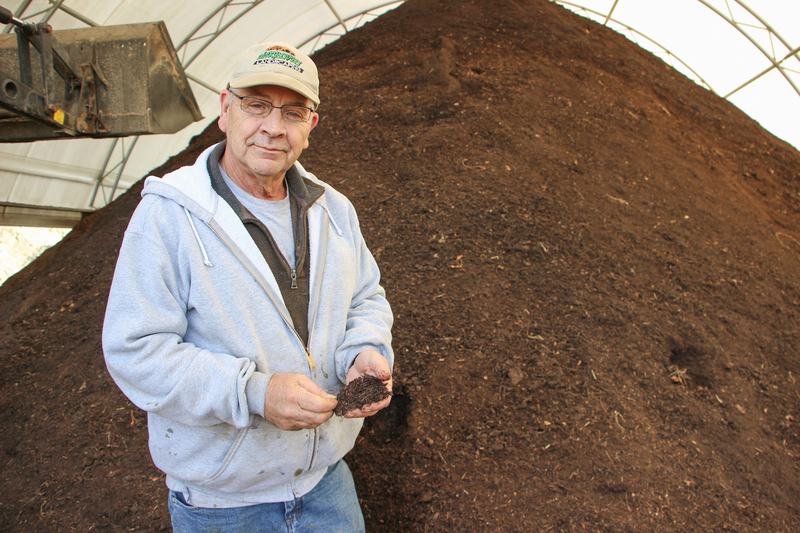 Kelly McKelvey gets a smile on his face when he talks about his small compost operation he started 10 years ago on the family dairy farm in Fredericksburg. Using a low cost, simple composting system, McKelvey recycles the solid waste from the cows’ bedpack and sells the compost to Woodland Mulch in Kidron, Ohio. Raising over 200 cows means a lot manure is being produced on the farm. Aside from selling excess liquid manure, using the simplest means possible, McKelvey converts solid wastes from the bedding pack into compost material. 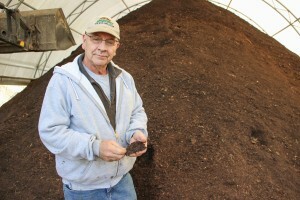 He uses static piles instead of large windrows and sells his finished product — which takes around a year to a year and a half to mature — to Woodland Mulch in Kidron. McKelvey took advantage of a cost share program with the soil and water conservation district to build a curing (finishing) shed. On top of his full-time farming duties, McKelvey is a Salt Creek Township trustee, and helps maintain township roads and the local cemetery. Prior to that, McKelvey served as a volunteer firefighter and EMT for 30 years and helped create the South Central Fire District board, the Fredericksburg fire department. “Kind of makes you wonder how I had time to farm,” he said. Now, McKelvey says both his sons volunteer for the local fire department. McKelvey said most of the farm decisions are split between him and his son, but McKelvey and his wife are handing more responsibilities to their son. “I’m just basically a worker,” joked McKelvey. There are always projects to work on, he added, and with harvest wrapped up, McKelvey said he has spent the last month preparing for winter. “I’ll be ready by about spring time,” he joked.